The story of Rahaf Mohammed, an 18-year-old Saudi girl who has become an international media darling for her flight to the West from "persecution", aired by Swedish national broadcaster SVT has made Swedes see red. In their piece on Rahaf Mohammad, the Saudi refugee girl who claimed to have suffered "abuse" back home due to her non-conformist behaviour, SVT omitted the reference to Islam, triggering many Swedes' ire. In the interview aired by SVT Aktuellt, Rahaf Mohammed said that she was kept locked up for six months after getting a short haircut and suffered abuse from her brother and her mother. The reason for it, she claimed, is that short haircuts for women are forbidden in Islam, because it makes women look like men. However, SVT's translation left out the Islam reference completely, with words "Islam" and "haram" ("forbidden" in Arabic) conspicuously absent from the subtitles, despite clearly being uttered by the teen. This mismatch was first observed by Sweden Democrat politician Kent Ekeroth, who compared the Swedish translation with the original English subtitles and summed up his findings in a piece in the news outlet Samhällsnytt, raising suspicions about state-sponsored censorship. Ekeroth's revelations made his compatriots spew bile at SVT's coverage and vent their outrage over the obligatory "TV tax" all Swedes have had to pay since New Year, regardless of whether they own a TV or not. "A strong start", Ekeroth himself smirked on Twitter. — Kent Ekeroth (@kentekeroth) 16 января 2019 г. ​"It's like doing away with the word 'Nazism' in a report about World War II survivors! Or 'communism' in a report about the Soviet Union", user Mikael Nilsson reacted. Blogger Hanna Lindholm, who identifies as "right-wing feminist", suggested that SVT has "gone nuclear" since their funding was guaranteed by the tax. Some compared SVT's "angled" coverage with that of the Communist era. To expand on this reference, one user posted an "updated" SVT logo with a hammer and sickle and corrupted Cyrillic letters, whereas another user mockingly spelled out SVT (originally "Sveriges Television") as "Stasi Vision TV". — Mats (@Stort_allvar) 16 января 2019 г. ​Others ventured that SVT's handling of the news content in accordance with its so-called "value base" was tantamount to "fake news". Yet another recurrent theme in the comments was that Sweden had allegedly "caved in" for Islam. 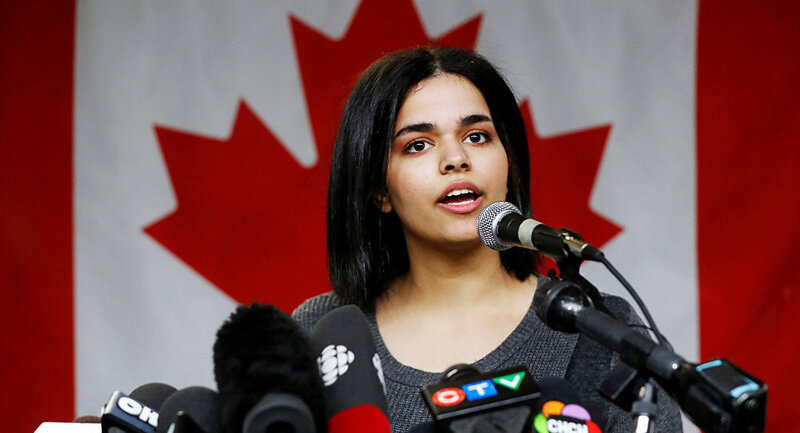 Rahaf Mohammed was offered asylum in Canada after a week's limbo in Bangkok, which she spent barricaded in a hotel room. As a token of an irrevocable breakaway from her family, she renounced her surname, al-Qulun, and quit Islam. Since then, she reports that she's received threats on the Internet. SVT is the Swedish national public television broadcaster; it is funded by a public service tax on personal income and largely modelled after the BBC.